The challenge was to design a belt attachment that provides secure carry at the desired angle, and remain inconspicuous. With a J-Hook or C-Hook, the holster can tilt and dive; and while a pair of loops on either side or a single wide loop around the belt can provide stability, they can also advertise "Gun!" to observers across the room. The solution is the Galco Y-Hook® (Patent Pending) premiered on our SkyOps holster. The Y-Hook grips as securely as a full loop, yet disappears to all but the most trained eye when worn on a black belt. 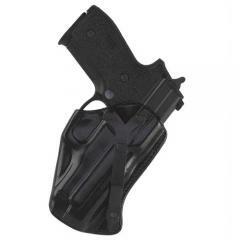 The SkyOps Inside The Pants Holster will not win the competition for easy on-and-off nor for quick draw and reholstering. But when it's all about stealth, and wearing a jacket is not an option, the Galco SkyOps Inside The Pants Holster sets the standard against which all others will be measured. Made for semiautomatic pistols, the SkyOps is ambidextrous and available in black finish.